According to Ellen Lupton and Jennifer C. Phillips in their book Graphic Design: The New Basics, Textures are both physical and virtual design elements that contain a visual function (pg 69). Texture can be used to add meaning to a design or image in a way that it tells a story. Throughout the graphic novel What It Is, Lynda Barry uses many different forms of texture to tell her story. On page 93 of her book, you can see all throughout the page the texture she was trying to create for her story. 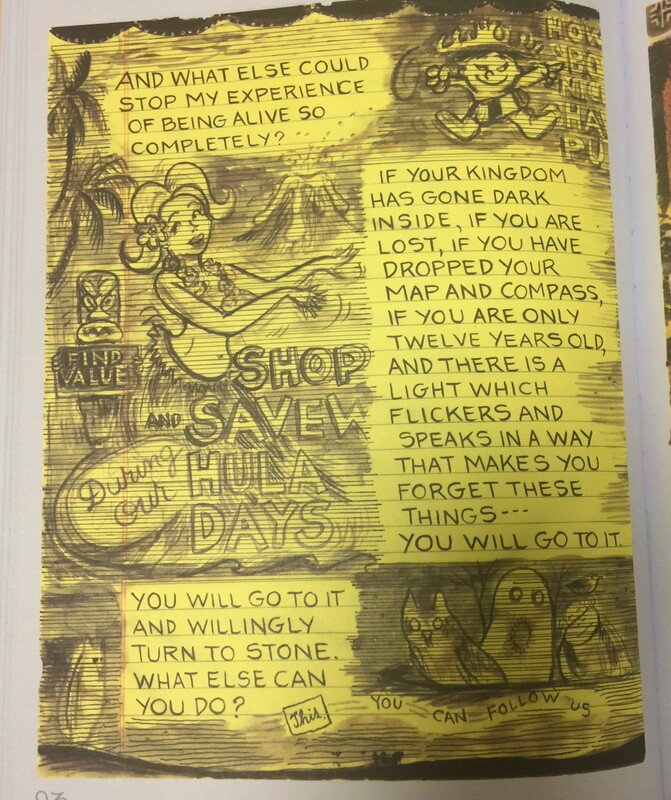 Throughout the writing “Shop and Savew Hula Days” you can see a form of surface manipulation. It looks like she repeatedly went over this writing multiple times to add emphasis to these words. This form of design texture can also be seen through out the rest of the page. The drawings such as the hula girl and the volcano, and also the little boy on the top right corner seem to have surface manipulation. I feel that Barry decided to go with this design texture because it gives the feeling that these pictures are sketches. The multiple lines that go over an image give the reader a sense that this is not a final draft, that its more of a sketch of the image. Throughout this entire page there are also multiple thin lines that go across the page, which make the page seem like it’s a piece of notebook paper. Which adds to the meaning of her images being sketches.